When you leave civilization and head out on a hunting or fishing trip, you want to have the right equipment with you. A good hunting knife set is essential for getting the most out of your hunt. And the best hunting knife will help ensure your success. 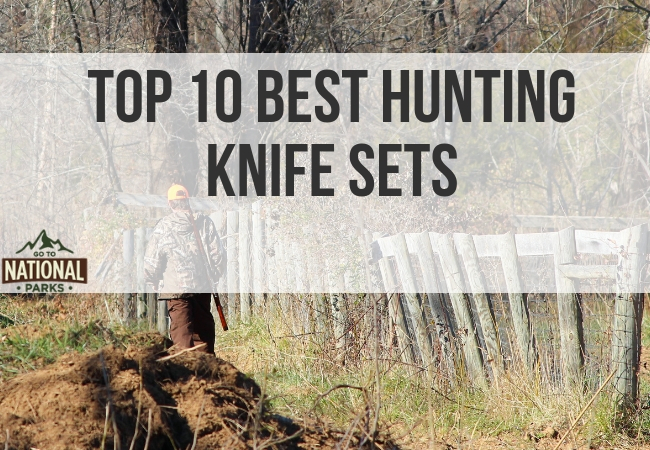 Let’s take a look at 10 of the best hunting knife sets on the market today. We’re always on the lookout for the latest advances in gear. And we also want to make sure you know about old, established models that have proved their worth time and again. What Is a Hunting Knife Set? How Much Do Hunting Knife Sets Cost? Where Can You Buy a Hunting Knife Set? Because we want to provide you with honest, reliable information, we didn’t only look at published specifications and marketing materials for hunting knife sets. Instead, we considered the opinions of both professional reviewers and actual customers. If you’ve never purchased a set of hunting knives before, you may have a few questions. You’ll find a number of considerations to take into account when choosing which one would best work for you. A hunting knife set is a collection of knives that help hunters and anglers dress, cut, and prepare game or fish. Sets come in a variety of configurations. And while most include a carrying case, not all do. The cost of hunting knife sets varies considerably. While some sell for as little as a few dollars, others can cost more than $100. Keep in mind, the price will depend on the number of knives, the materials use, and the construction of the case. But remember, the best hunting knife set may not be the most expensive one. 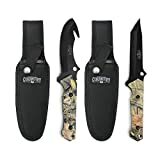 Most sporting goods stores and outfitting shops sell hunting knife sets. They are also available online through third-party sites, such as Amazon. As mentioned in our FAQ section, hunting knife sets have a broad price range. The price difference is due to the size of the sets and added features. 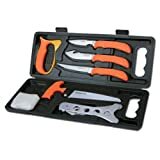 Before you go out and purchase one of these best hunting knife sets based on price or rating, you should do a little research. While all of these sets offer excellent value, some may suit other hunters and fishermen more than others. 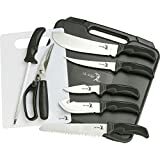 Let’s take a look at what features set these knife sets apart so you can make the best choice for you. In our opinion, there is a clear standout in the crowded field of hunting knife sets. The Outdoor Edge Game Processor set is as complete as it is functional. The set features a long butcher knife and a carving fork. While other sets on our list have butcher knives, none includes a carving fork. For either field dressing or food preparation, this set is tremendously useful. All the blades in the Game Processor sets are sharp and simple to sharpen. The set also comes with a cutting board and a convenient carrying case. And if you are counting, there are 12 versatile pieces in this set. Buck is an iconic knife brand for a good reason. The company has a hard-earned reputation for making some of the best-quality hunting knives in history. Its PakLite hunting knife set is no exception. The set also proves that you don’t need a dozen knives to get the most out of your hunting trip. The PakLite hunting knife set has a skinning blade, a caping blade, and a gut-hook ring. These knives are made from a lightweight, durable, and modern material. Simply put, these knives look as good as they work, which is why they make our list of the best hunting knife sets you can buy. The blades stay sharp through several uses. When you need to sharpen them, obtaining a good edge is simple. 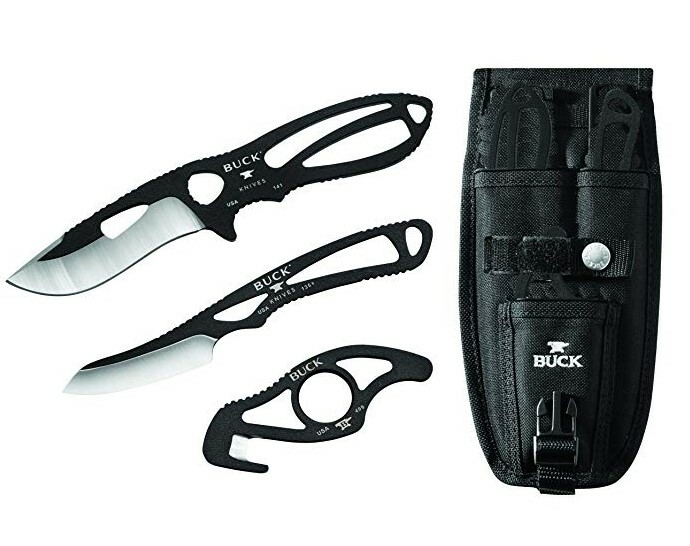 Also, the set includes a compact sheath with removable liners to help keep it clean. And like all Buck knives, the PakLite is made in the United States. Made from a lightweight, durable and modern material. One of the blades is used and they look like a knock off version. 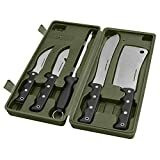 Rounding out the top three of our list of the 10 best hunting knife sets is the Outdoor Edge Butcher Lite hunting knife set. This set gives you everything you need to be a butcher in the field. 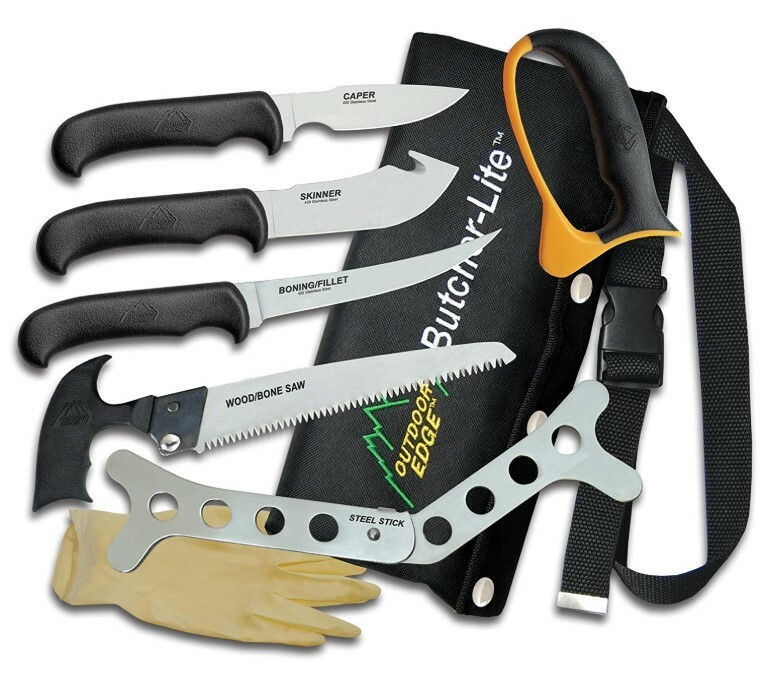 The Butcher Lite has four multi-purpose knives, a filet knife, and a wood-and-bone saw. It also comes with a limited lifetime warranty to give you peace of mind when buying your new set of hunting knives. We aren’t easy to impress, but the Butcher Lite’s snap-in knife scabbards wow us. These scabbards give you greater leverage when dressing game. Best of all, you don’t have to get your hands dirty, either. That’s because the set’s game-cleaning gloves are durable and reusable. Not recommended for high constant butchering. 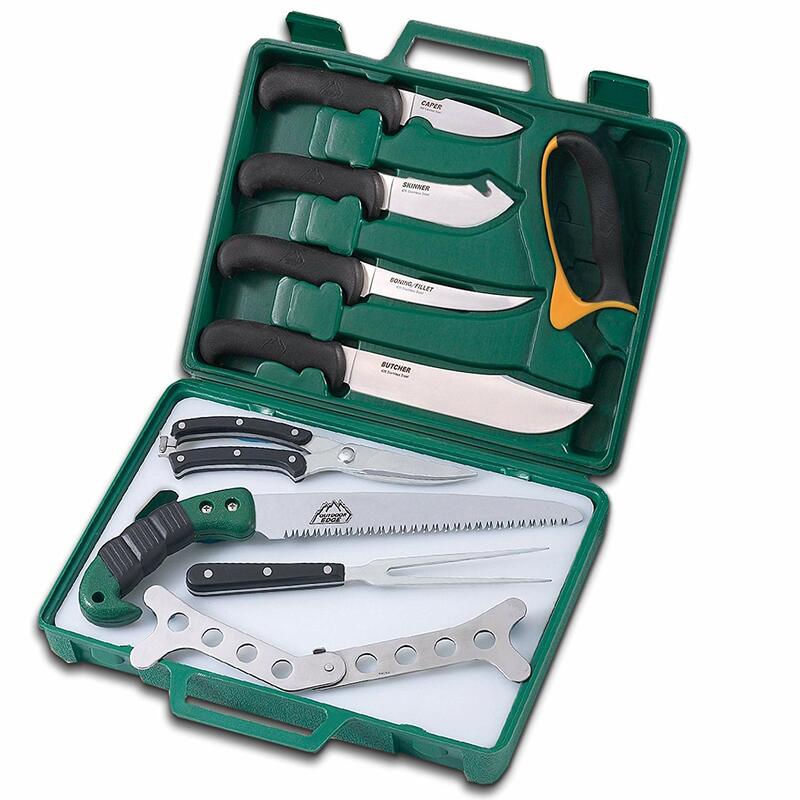 The Outdoor Edge Wild Pak eight-piece hunting knife set is one of our favorites. 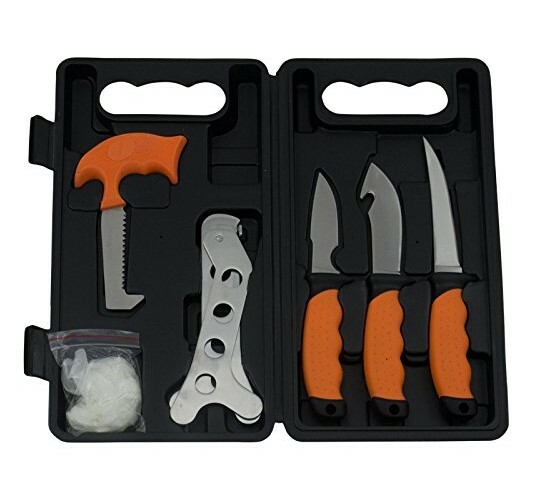 This set includes a hook knife, a rib spreader, a saw blade, and a couple of straight knives. While the blades come pre-sharpened, keeping them sharp is a breeze. With just a bit of effort and a honing stone, you have exactly what you need to dress most game or produce best meat cuts. If you are a trophy collector, you will appreciate the two-and-one-half-inch caping knife. This knife allows you to remove the facial hide of an animal without damaging the skin. This feature makes it one of the best hunting knife sets for precision. While the handles on the knives have a slightly slippery feel, they are bright orange. This makes spotting dropped knives in dense brush easy. Nonetheless, you probably don’t want to lug the large carrying case with you on deep-woods adventures. At the midpoint on our list of the best hunting knife sets sits the Red Deer field kit. This hunting knife set is the best mid-range set on the market today. The Red Deer set comes with three skinning knives, giving you the option of choosing the one that best fits your style and the game you hunt. The set also includes a folding gambrel and latex gloves. We like the rubber handles on the Red Deer field kit knives. They are easy to grip and come in a couple of different colors. Perhaps the best feature of the set, though, is the bone saw. Its sharp, jagged blade cuts through almost anything, and it doesn’t dull quickly. We didn’t rank this kit higher due to its awkward carrying case. The case is unnecessarily large and heavy. We think if you decide to purchase this set, you will likely send the carrying case to the dump. The case is unnecessarily large and heavy. Although we have another Elk Ridge set on our list, this two-piece set is better than the other set. This one includes a four-inch cut-hook blade with a finger hole to give you extra control when slicing through game. It also has a straight blade with a lanyard hole that is optimal for anglers who need fast access to their knives. 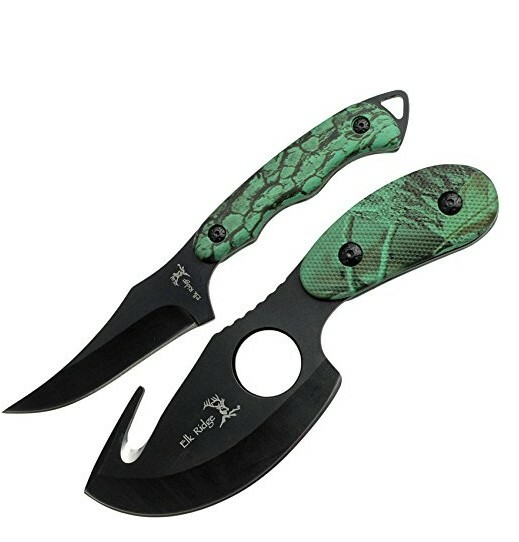 The handles on the Elk Ridge Blades two-piece hunting knife set are a vibrant green color. They feel comfortable in the hand, although they are small. Also, we love the nylon dual-carrying sheath that holds the two-piece set. Both durable and lightweight, the sheath attaches to your belt or fits nicely inside your gear bag. Nonetheless, if you have large hands, this probably isn’t the right hunting knife set for you. If you’re far from civilization, you likely don’t want to carry even the best hunting knife set if it’s too big and bulky. Multiple knife sets are often heavy. Instead, a basic knife set works for skinning game in the field. The Mossy Oak two-piece hunting knife set stands out for its simplicity. 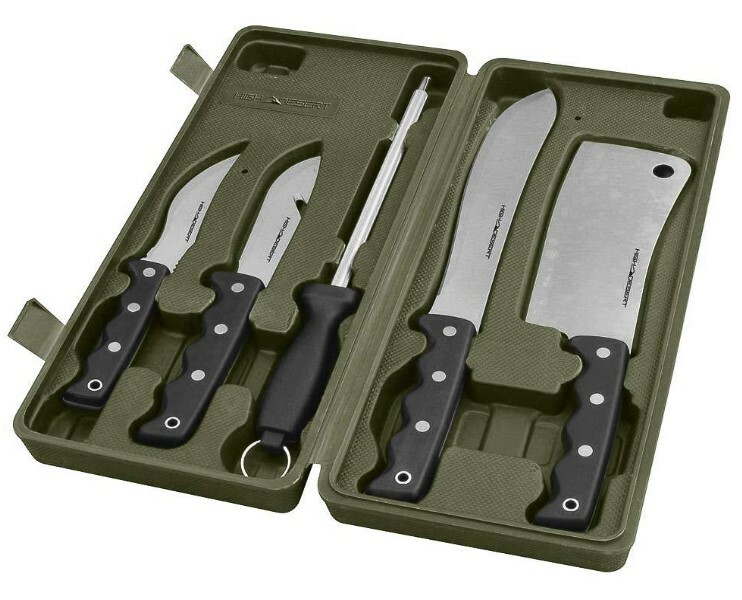 With only two knives, the set is portable and lightweight. 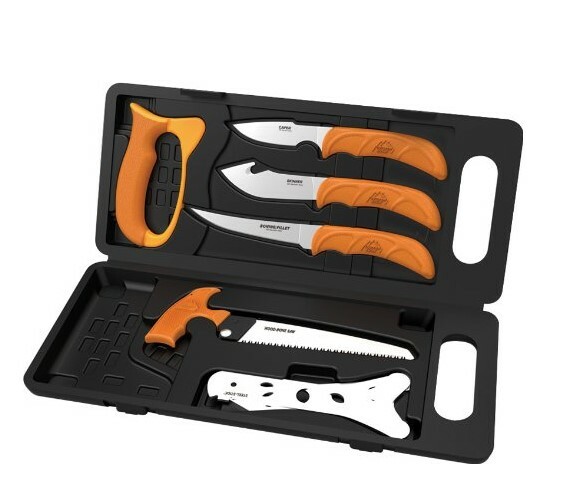 This set comes with a fixed-cut hook knife and a 10-inch drop-point blade. Both knives fit inside their own cases, which sheathe securely to your belt. The handles on these Mossy Oak knives are comfortable to hold and feature a camouflage pattern. However, while the design of the knives is optimal for field dressing, it also makes blade sharpening challenging. Some users choose to replace the knives instead of sharpening them. That bothers us. The eighth best hunting knife set in our opinion is a collection from Elk Ridge. 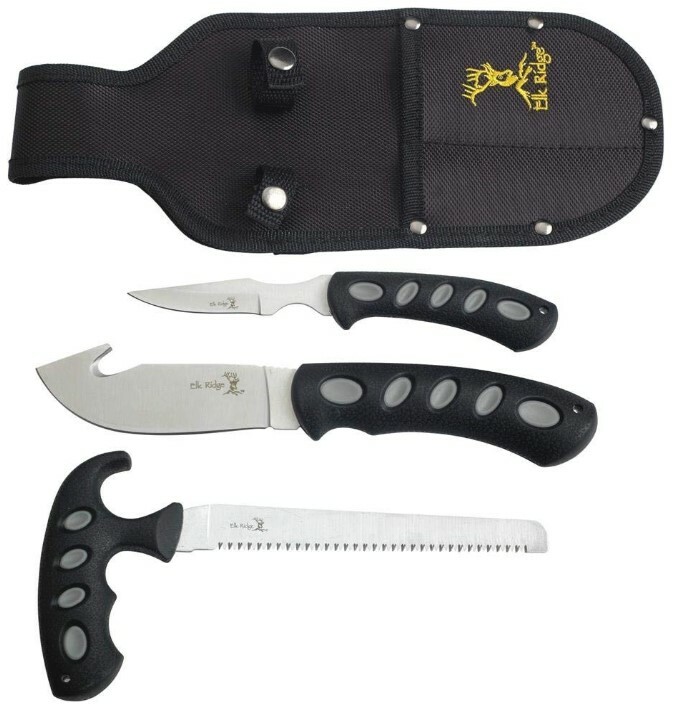 The ER 252 three-piece hunting knife set includes a saw blade, a dagger-star knife, and a cut hook. If you hunt large game, this set gives you what you need to field dress like a pro, making this one of the best hunting knife sets for the serious and dedicated hunter. In addition, the knives fit conveniently into a soft-sided carrying pouch. Perhaps the best feature of the Elk Ridge ER-252 hunting knife set is its sharpness. Once you sharpen the blades on these knives, they continue to hold up well. Unfortunately, we don’t love their plastic handles. While the plastic grips resist corrosion, they can be difficult to grip. The bone saw also seems a bit flimsy to us. Still, reviewers mostly have positive things to say about the Elk Ridge ER-252 set. 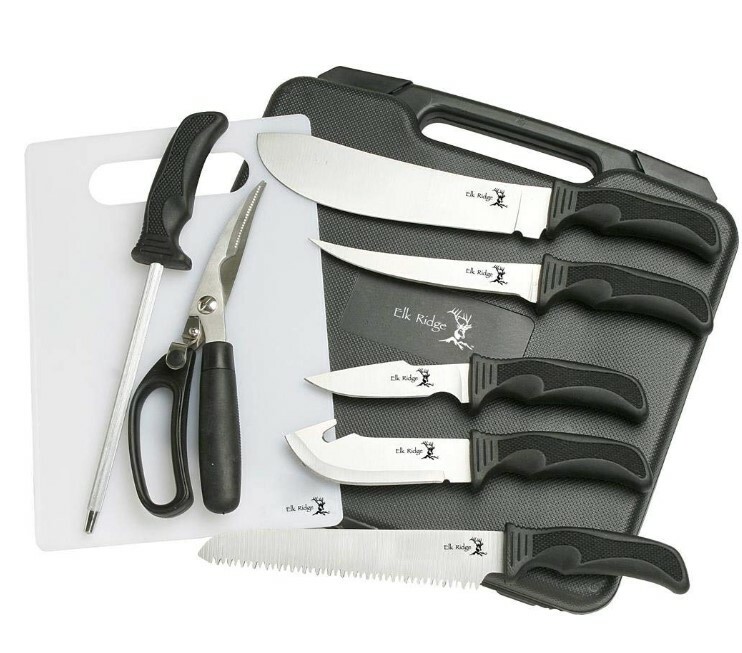 The Elk Ridge Cutlery nine-piece hunting knife set is a versatile set for both hunters and anglers. These knives feature stainless-steel blades that resist corrosion and wear even in harsh environments. Moreover, the rubber handles on the knives give you a responsive, powerful and secure grip that helps you avoid injury while making precise cuts in game or fish. You keep these knives sharp with an included honing stone. Like many other sets, the Elk Ridge Cutlery nine-piece hunting knife collection comes with shears that are sharp enough to cut through meat and some bone. An included carrying case keeps these knives nicely organized.This comprehensive approach by Elk Ridge makes this one of the best knife sets for hunters and anglers alike. However, while we like many of the features of the Elk Ridge Cutlery nine-piece hunting knife set, we think the blades are too flexible. While you want some flex to filet meat successfully, Elk Ridge Cutlery simply takes it too far with this set. Still, the completeness of this set is good enough to land it on our top 10 list. These bend far to easily and when field dressing a deer we don’t want the blades to snap. 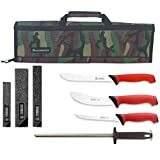 If you routinely experience hand fatigue while dressing game or preparing meals, you will likely appreciate the comfortable handles of the High Desert Butcher four-piece hunting knife set. The grips on these knives fit nicely into the grooves of your fingers. Additionally, the handle size is appropriate for most hunters or anglers. The set includes a cleaver, which we like. It also has a butcher knife with an 8-inch blade which is sufficient for making a variety of cuts. The set is far from perfect, though. Even though it is one of the best knife sets on the current market, we’re not happy about the simplicity of the High Desert Butcher set. With only a cleaver and three knives, the set doesn’t have many of the specialty knives that other sets include. Also, some users report that the blades on these knives dull too easily. Sharp and good to go out of the box. 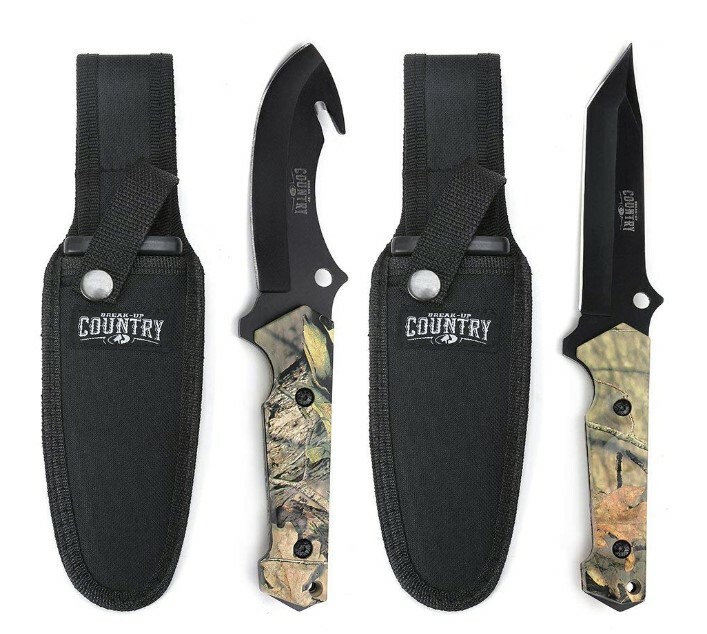 Our favorite hunting knife set is the Outdoor Edge Game Processor. The versatility and quality of this set are hard to beat. 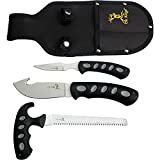 Nonetheless, which hunting knife set is right for you likely depends on your hunting or fishing style. Fortunately, all of the sets on our rankings have some impressive features.